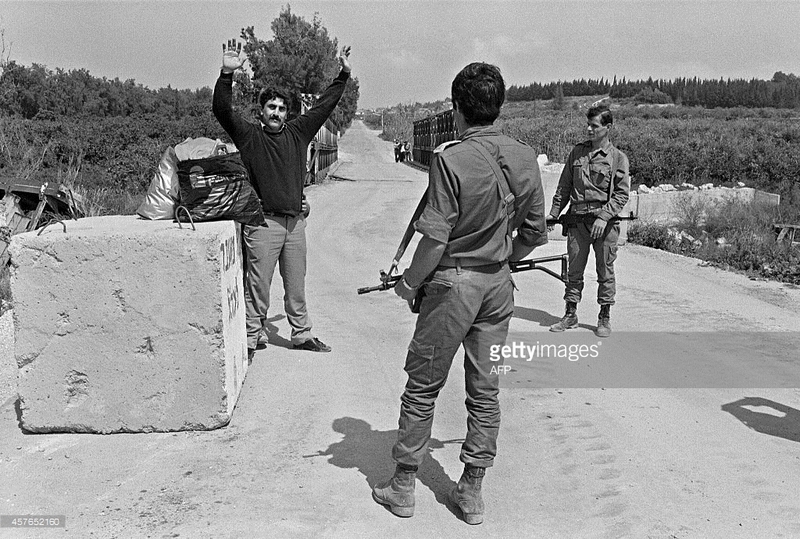 When the Israeli army started retreating towards the security zone after the 1982 invasion, Lebanese militias fought to fill the vacancy Israel left behind. Today’s post is made of cables covering that period of time. The cables are organized chronologically. 1. (U) SUMMARY AND INTRODUCTION. HEAVY FIGHTING IN THE SIDON AREA CONTINUED ON MARCH 30-31 CAUSING NUMEROUS CASUALTIES. ACCORDING TO MOST REPORTS REACHING BEIRUT, THE FIGHTING, WHICH FOLLOWS RECENT LF-LAF CLASHES IN THE AREA (REFTEL), INCLUDED THE STRONG, DIRECT INVOLVEMENT OF ARMED PALESTINIAN ELEMENTS FOR THE FIRST TIME. 2. (U) WIDELY PORTRAYED HERE AS PART OF AN ISRAELI PLAN TO REDISTRIBUTE THE POPULATION OF SOUTH LEBANON AND TO FORM A PREDOMINANTLY CHRISTIAN BORDER SECURITY STRIP, THE CLASHES IN SIDON HAVE PREOCCUPIED LEBANESE GOVERNMENTAL, POLITICAL, AND RELIGIOUS LEADERS OVER THE WEEKEND. PRIME MINISTER KARAMI CALLED INDIRECTLY ON THE U.S. TO USE ITS INFLUENCE TO HALT THE ALLEGED ISRAELI PLAN. SYRIAN MILITARY INTELLIGENCE CHIEF GENERAL KHOLI IS EXPECTED IN BEIRUT TODAY, APRIL 1, TO DISCUSS RECENT POLITICAL AND SECURITY DEVELOPMENTS WITH PRESIDENT GEMAYEL. END SUMMARY AND INTRODUCTION. 2. (U) FIGHTING INTENSIFIED IN THE SIDON AREA ON MARCH 30-31 BETWEEN LF MILITIAMEN AND LAF UNITS. ACCORDING TO PRESS REPORTS, HOWEVER, THE LAF’S ROLE WAS ECLIPSED WHEN PALESTINIAN UNITS BASED IN THE REFUGEE CAMPS TOOK A STRONG, ACTIVE ROLE IN THE FIGHTING AGAINST THE LF. 3. U) ON MARCH 30, THE LF REPORTEDLY BEGAN HEAVY, ALMOST CONTINUOUS SHELLING OF THE REFUGEE CAMPS AT AYN AL-HILWAH AND MIYAH MIYAH AND OF OTHER RESIDENTIAL AREAS IN SIDON. PRO-ARAFAT PALESTINIAN FORCES, BACKED BY OTHER MUSLIM MILITIAS, RESPONDED AND HEAVY FIGHTING ENSUED. SIMULTANEOUSLY, CLASHES BETWEEN THE LF AND LAF WERE REPORTED ALONG A LINE INCLUDING KANAYA, KAHAYA, HLALIYAH, AND BRAMIYAH. THERE ARE ALSO REPORTS OF AMAL UNITS TAKING PART IN THE FIGHTING IN SIDON, BUT WE HAVE NO DETAILED INFORMATION. THE MARCH 30 CASUALTY TOLL AMOUNTED TO TWENTY-EIGHT KILLED AND FORTY WOUNDED, MOSTLY CIVILIANS. 4. (U) ON MARCH 31, THE FIGHTING CONTINUED, WITH THE MOST INTENSIVE ACTION CENTERED AROUND THE AYN AL-HILWAH REFUGEE CAMP. ACCORDING TO FOREIGN CORRESPONDENTS CITED IN THE LOCAL PRESS, THE CAMP CAME UNDER HEAVY SHELLING FROM LF ARTILLERY POSITIONS NEAR JEZZIN. HEAVY FIGHTING WAS ALSO REPORTED BETWEEN LF UNITS AND LAF POSITONS ON MAR ELIAS HILL. THE MARCH 31 CASUALTY TOLL AMOUNTED TO FIVE KILLED AND FIFTEEN WOUNDED. THERE ARE UNCONFIRMED REPORTS OF PALESTINIAN CIVILIANS FLEEING THE CAMPS FOR SIDON ITSELF AND OF SUNNI AND CHRISTIAN RESIDENTS OF SIDON MOVING NORTHWARD TO BEIRUT. 5. (U) ELSEWHERE IN THE SOUTH, ISRAELI UNITS REPORTEDLY CROSSED BACK INTO PREVIOUSLY EVACUATED TERRITORY FOR THE SIXTH TIME AS PART OF A DRAGNET OPERATION IN THE IQLIM AL-TIFFAH REGION SOUTH OF SIDON. LENGTHY LOCAL PRESS REPORTS INDICATE TWENTY-THREE PERSONS KILLED AND FORTY-FIVE PERSONS WOUNDED, MOSTLY IN THE VILLAGE OF JBAA. 6. (LOU) IN THE ONLY OTHER SIGNIFICANT FIGHTING OVER THE WEEKEND, LAF UNITS EXCHANGED ARTILLERY FIRE WITH PSP MILITIAMEN ON MARCH 30 ALONG THE SUQ AL-GHARB/AYTAT RIDGELINE FRONT SOUTHEAST OF BEIRUT. TWO LAF SOLDIERS WERE REPORTEDLY KILLED. WHEN THE SHELLING SPILLED OVER ONTO THE EAST-BEIRUT RESIDENTIAL AREAS OF BAABDA, HAZIMIYAH, AND MKALLAS, SEVERAL SHELLS HIT JUST OUTSIDE THE PERIMETER OF THE AMBASSADOR’S RESIDENCE AT YARZE. EMBASSY PERSONNEL HAD ALREADY TAKEN REFUGE IN THE SHELTER. 7. (U) EFFORTS TO HALT THE DETERIORATION OF THE SITUATION IN SOUTH LEBANON PREOCCUPIED LEBANESE GOVERNMENTAL, POLITICAL, AND RELIGIOUS LEADERS THROUGHOUT THE WEEKEND. ACCORDING TO PRESS REPORTS, FOLLOWING A MEETING ON MARCH 30, PRESIDENT GEMAYEL, PRIME MINISTER KARAMI, AND SENIOR LAF OFFICERS DECIDED TO REINFORCE LEBANESE ARMY UNITS IN THE SOUTH, IN PART WITH EQUIPMENT NOW BEING DELIVERED FROM THE U.S. MINISTERS HOSS AND BARRI, WHO TRAVELED TO DAMASCUS MARCH 31 TO MEET WITH SARG VICE PRESIDENT KHADDAM AND DRUZE LEADER JUMBLATT, HAVE DEMANDED SUCH A REINFORCEMENT OF LAF UNITS IN THE SOUTH FOR SEVERAL WEEKS. 8. (U) FOLLOWING THE MARCH 30 MEETING, PRIME MINISTER KARAMI ACCUSED ISRAEL OF PROVOKING THE VIOLENCE IN SIDON “IN THE HOPE OF OBTAINING A NEW DISTRIBUTION OF THE POPULATION (ON A CONFESSIONAL BASIS) AND EVENTUALLY ESTABLISHING A BUFFER ZONE (ALONG THE BORDER STRIP).” STATING THAT THE SITUATION IN THE SOUTH MUST BE UNDERSTOOD IN THE REGIONAL CONTEXT, KARAMI SAID THAT THE GOL WOULD UNDERTAKE CONTACTS WITH OTHER GOVERNMENTS WHICH HAVE INFLUENCE IN THE REGION. 9. (U) NOTING THAT “THE UNITED STATES IN PARTICULAR CAN ACT TO CLEAN UP THE SITUATION,” KARAMI ADDED THAT THE GOL HAD NOT/NOT BEEN INFORMED OF A VISIT TO LEBANON BY ASSISTANT SECRETARY MURPHY DURING THE LATTER’S FORTHCOMING TRIP TO THE MIDDLE EAST. 11. (U) IN A MARCH 31 TELEPHONE CONVERSATION WITH SARG PRESIDENT ASSAD, PRESIDENT GEMAYEL AGREED TO RECEIVE A SYRIAN ENVOY TO DISCUSS THE SITUATION IN SIDON AS WELL AS RECENT POLITICAL DEVELOPMENTS WITHIN THE CHRISTIAN COMMUNITY. SYRIAN MILITARY INTELLIGENCE CHIEF GENERAL KHOLI IS EXPECTED TO MEET WITH GEMAYEL TODAY, APRIL 1. 12. (C) COMMENT. THE CONTRADICTORY AND TENDENTIOUS REPORTS REACHING BEIRUT ABOUT THE FIGHTING IN SIDON ARE DIFFICULT TO UNRAVEL AND EVALUATE. PALESTINIAN UNITS DO APPEAR TO BE TAKING AN ACTIVE PART IN THE CLASHES. IN SHORT, THE SITUATION IN THE SOUTH APPEARS TO BE DETERIORATING, AS EVERYONE HAD FEARED, INTO A HEIGHTENED LEBANESE/ISRAELI CONFLICT AND BITTER INTERCOMMUNAL CLASHES WITH PALESTINIAN INVOLVEMENT. 2. ISRAEL REPORTEDLY CONTINUES CONTACTS AIMED AT USING INDIGENOUS FORCES TO MAINTAIN BORDER SECURITY AFTER THE JUNE 1 WITHDRAWAL OF ISRAELI TROOPS. ACCORDING TO LOCAL PRESS, THE ISRAELIS HAVE REACHED A COMPROMISE WITH THE DRUZE OF THE HASBAYA REGION WHEREBY THE DRUZE INHABITANTS WILL FORM A “CIVIL GUARD,” BUT WILL NOT HAVE DIRECT TIES TO THE ASL OR ANY OTHER ISRAELI-BACKED ORGANIZATION. IF THESE REPORTS ARE TRUE, THIS DEAL REPRESENTS A VICTORY FOR THE LOCAL DRUZE WHO HAVE ALLEGEDLY BEEN RESISTING ISRAELI PRESSURE (WHICH INCLUDED A BLOCKADE OF THE VILLAGES OF AKA KAMA AND MIMAS) TO RECRUIT THEM INTO THE ASL. 3. IN THE JAZZIN AREA, LOCAL PRESS REPORTS THAT EFFORTS ARE UNDERWAY TO ESTABLISH A 300-400 MAN CHRISTIAN FORCE INDEPENDENT OF THE ASL. THESE REPORTS SUPPORT OTHER INFORMATION THE EMBASSY HAS RECEIVED CONCERNING A DEAL ALLEGEDLY STRUCK BETWEEN WALID JUMBLATT AND THE CHRISTIANS OF JAZZIN CONCERNING SECURITY ARRANGEMENTS FOR JAZZIN AND THE IQLIM AL-KHARRUB. DETAILS WERE REPORTEDLY HAMMERED OUT AT A MEETING HELD LAST WEEK IN MUKHTARA ATTENDED BY JUMBLATT, JEAN AZIZ, JAZZIN DEPUTY EDMOND RIZK, AND AN UNIDENTIFIED ISRAELI OFFICER. AT THIS MEETING, JUMBLATT REPORTEDLY ACCEPTED THE FORMATION OF THIS CHRISTIAN FORCE, PROVIDED IT HAD NO OVERT CONNECTION WITH THE ASL; HE ALSO APPARENTLY SAID HE WOULD NOT ATTACK THE CHRISTIANS OF THE JAZZIN AREA OR THE IQLIM AL-KHARRUB AND OFFERED TO OPEN THE CHUF ROAD TO CHRISTIAN TRAFFIC IF THE COASTAL ROADS WERE CLOSED TO THEM. IN RETURN, JUMBLATT ASKED FOR AN OPEN ROAD FROM THE CHUF TO THE DRUZE VILLAGES OF HASBAYA AND ROSHAYYA IN THE SOUTH, AND REMOVAL OF LF ELEMENTS FROM OUTSIDE THE AREA. 4. IN SIDON, THE TWO AXES OF CONFRONTATION REMAINED ACTIVE OVER THE WEEKEND. ONE FRONT PITS LF FIGHTERS IN THE VILLAGES OF ABRA, HLALIYAH, AND QAYYA (SOUTHEAST OF SIDON) AGAINST SUNNI AND PALESTINIAN MILITIAMEN SUPPORTED BY THE LAF’S SUNNI TAWEED 98TH BRIGADE FROM TRIPOLI LOCATED ON THE HILL OF MAR ELIAS. ON THE OTHER FRONT, ALSO LOCATED IN THE EASTERN SUBURBS, LF MILITIAMEN BASED IN THE VILLAGES OF MIYAH MIYAH, MAGHDUSHEH, AND DARB AL-SIM CONFRONT THE PALESTINIAN CAMPS OF MIYAH MIYAH AND AYN AL-HILWAH. ON FRIDAY AND SATURDAY, FOR THE FIRST TIME, 155 MM SHELLS FELL ON THE LAF’S ZGHAYB BARRACKS IN CENTRAL SIDON. LOCAL PRESS REPORTS CASUALTY FIGURES AS HIGH AS 26 KILLED AND WOUNDED IN WEEKEND FIGHTING. 6. IN CONTRAST TO THE INFLAMMATORY RHETORIC EMANATING FROM SIDON’S MUSLIMS, THE CHRISTIAN COMMUNITY SEEMS INTENT ON DAMPING DOWN THE LEVEL OF TENSION. FOLLOWING A VISIT TO ISRAEL (REF B) DURING WHICH HE WAS REPORTEDLY WARNED BY THE ISRAELIS NOT TO MAKE TROUBLE IN SIDON, AND AFTER A WEEKEND OF CONSULTATIONS WITH FORMER PRESIDENT CAMILLE CHAMOUN, SAMIR JA’JA’ HELD A MORNING PRESS CONFERENCE ON APRIL 22 TO ANNOUNCE LF MEASURES AIMED AT DEFUSING THE CRISIS. ALTHOUGH WE HAVE NOT SEEN THE TEXT OF JA’JA’S STATEMENT, WE UNDERSTAND THESE TO INCLUDE: — A. A UNILATERAL CEASEFIRE EFFECTIVE 1600 LOCAL TIME ON APRIL 22; — B. A WITHDRAWAL OF NON-INDIGENOUS LF FORCES FROM THE SIDON AREA BEGINNING 1100 LOCAL TIME ON APRIL 23. THIS WITHDRAWAL IS IN ORDER TO “GIVE THE CENTRAL GOVERNMENT A CHANCE TO UNDERTAKE ITS RESPONSIBILITIES.” (MILITIAMEN NATIVE TO THE AREA WILL REMAIN); — C. A CALL FOR THE PRESIDENT, PM, GOVERNMENT, AND LAF COMMAND TO ASSUME RESPONSIBILITY FOR SECURITY VIOLATIONS. JA’JA’ FURTHER STATED HIS HOPE THAT THESE MEASURES WOULD CONSTITUTE A FIRST STEP TOWARD A SETTLEMENT AND CALL FORTH PEACE INITIATIVES FROM THE OTHER PARTIES INVOLVED. HE INVITED JOURNALISTS TO WITNESS TOMORROW’S WITHDRAWAL. 7. ON THE MILITARY LEVEL, THE QUADRIPARTITE MILITARY COMMISSION IS REPORTED BY THE PRESS TO BE WORKING FOR THE DEPLOYMENT OF AN ADDITIONAL LAF UNIT TO SIDON. NO DETAILS OF ARMAMENT OR CONFESSIONAL COMPOSITION ARE AVAILABLE. IN ANY EVENT, PAST HISTORY INDICATES THAT IT CANNOT BE DEPLOYED IN THE ABSENCE OF A PRIOR POLITICAL AGREEMENT. 8. ONE USUALLY WELL INFORMED LOCAL PRESS SOURCE TELLS US THAT SYRIA IS TRYING TO PUT IN PLACE A SCENARIO WHEREBY SUNNIS OF SIDON CAN CLAIM VICTORY OVER THE LF AS A SOP FOR RECENT SUNNI LOSSES IN WEST BEIRUT. THE PRICE OF SUCH A DEAL, HOWEVER, IS ALLEGED TO BE RENUNCIATION BY SUNNIS OF THEIR LINKS WITH PRO-ARAFAT PLO PALESTINIANS AND ACCEPTANCE OF RELIANCE UPON DRUZE AND ABU MUSA PALESTINIANS IN THEIR STEAD. THE ALTERNA- TIVE, ACCORDING TO THIS SOURCE, IS FOR DRUZE, ABU MUSA MILITIA, AND AMAL TO ADMINISTER THE SAME LESSON IN SIDON THAT THEY DID IN WEST BEIRUT. 9. IN TYRE, ISRAELI FORCES CONTINUE THEIR PREPARATIONS FOR WITHDRAWAL. IDF SPOKESMEN HAVE ANNOUNCED A WITHDRAWAL DATE OF APRIL 24, BUT ACTIVITIES ON THE GROUND INDICATE IT MAY OCCUR UP TO 24 HOURS EARLIER. ALL BUILDINGS AND INSTALLATIONS OF POTENTIAL USE TO THE RESISTANCE ARE BEING DYNAMITED, THERE IS AS YET NO WORD ON POSSIBLE LAF DEPLOYMENT AFTER THE ISRAELI WITHDRAWAL. 1. (U) LOCAL PRESS REPORTS THE COMPLETION ON APRIL 24 OF THE WITHDRAWAL OF 450 LF MILITIAMEN FROM THE SIDON AREA TO EAST BEIRUT. HOWEVER, THESE REPORTS CONTINUE, LAF UNITS HAVE STILL NOT OCCUPIED THE FORMER LF POSITIONS EAST OF THE CITY, AND SPORADIC EXCHANGES OF FIRE CONTINUE TO MAR THE CEASE-FIRE. LF MILITIAMEN NATIVE TO THE AREA ARE SAID TO REMAIN ARMED AND IN UNIFORM. SCATTERED FIGHTING WAS REPORTED ON BOTH MAIN AXES OF CONFRONTATION WITH LF FIGHTERS IN QAYAA EXCHANGING FIRE WITH THE LAF, AND PALESTINIANS FROM THE MIYAH MIYAH CAMP FIRING MORTAR ROUNDS INTO THE VILLAGE OF MIYAH MIYAH. LF OFFICIALS DENY THAT THE CHRISTIANS RETURNED FIRE, BUT THE PALESTINIANS CLAIM NINE WERE WOUNDED BY CHRISTIAN FIRE. THE CITY REMAINS TENSE. 3. (U) OF THE NEWLY EVACUATED AREAS, ONLY THE WEST BIQA’ HAS BEEN OCCUPIED BY THE LAF, ACCORDING TO PRESS REPORTS. THERE, UNITS OF THE SHIA FIRST BRIGADE WERE WARMLY GREETED BY AREA RESIDENTS. PSP FORCES, HOWEVER, OCCUPIED THE STRATEGIC HILL OF JABAL BARUK, ALTHOUGH THE ISRAELIS HAD DISMANTLED THEIR INSTALLATIONS BEFORE DEPARTING. THE SITUATION IN JAZZIN, REPORTED REFTEL, REMAINS UNCLEAR. 4. (C) COMMENT. EMBASSY CONTACTS HAVE LONG INDICATED THAT PSP LEADER WALID JUMBLATT INTENDED TO OCCUPY JABAL BARUK ONCE THE ISRAELIS LEFT. IT IS UNLIKELY HE WILL BE CONVINCED TO YIELD THIS STRATEGIC POSITION TO AN LAF FORCE HE DOES NOT CONTROL. END COMMENT. 2. CONFUSION CONTINUES ABOUT EXACT SITUATION IN VILLAGES EAST OF SIDON (REFTEL) WITH BEIRUT PARTIES PLAYING USUAL ROLES IN GREEK CHORUS ON SIDELINES. PALESTINIAN AND FUNDAMENTALIST MUSLIM FORCES APPARENTLY CONTINUE TO OCCUPY SEVEN CHRISTIAN TOWNS THEY SEIZED EAST OF SIDON. REPORTS FILTER IN ABOUT SOME 25,000 TO 75,000 CHRISTIAN REFUGEES FROM REGION FLEEING TO EITHER JEZZIN OR BEIRUT. 3. MEANWHILE, ESLEWHERE: – ASL COMMANDER LAHAD REPORTEDLY ISSUED STATEMENT 26 APRIL THREATENING TO SHELL SIDON UNLESS PALESTINIANS AND MUSLIM MILITIA CEASE OFFENSIVE. HE ALSO IS QUOTED AS WARNING LAF AGAINST SENDING TROOPS TO JEZZIN “BEFORE BRINGING THE SECURITY SITUATION IN SIDON UNDER CONTROL AND FORCING THE PALESTINIANS BACK INTO THEIR CAMPS.” – PRESIDENT GEMAYEL TELEPHONED SYRIAN PRESIDENT ASSAD TO BRIEF HIM ON DEVELOPMENTS IN SIDON; TWO LEADERS AGREED TO KEEP IN TOUCH. – CHRISTIAN RELIGIOUS LEADERS MET 26 FRIDAY AND DEPLORED SITUATION IN SIDON, CALLED ON FRIENDLY COUNTRIES (“PARTICULARLY SYRIA”), “ALL FREE NATIONS”, AND POPE TO HELP. OTHER CHRISTIAN LEADERS, LED BY CAMILLE CHAMOUN, ISSUED SIMILAR STATEMENTS – GEMAYEL, PARLIAMENT SPEAKER HUSSEINI, AND PM KARAMI MET 26 APRIL TO REVIEW SITUATION. KARAMI AFTER MEETING COMMENTED IN PART THAT RECENT ATTACKS IN SIDON WERE “REACTIONS WHICH EXPOSED OUR BROTHERS…TO WHAT HAD HAPPENED TO THEIR BROTHERS IN SIDON”, COMMENT WHICH SPARKED SHARP CHRISTIAN REACTION AGAINST WHAT THEY VIEWED AS EXAMPLE OF KARAMI’S LACK OF CONCERN FOR CHRISTIANS WOES. REMAINDER OF KARAMI’S REMARKS AND THOSE OF HUSSEINI AND OTHER MUSLIM LEADERS WERE DUTIFULLY SOLEMN. – SIDON DEPUTY NAZIH BIZRI ISSUED A STATEMENT CONGRATULATING THE INHABITANTS OF SIDON FOR THEIR, “VICTORY AGAINST THE LEBANESE FORCES AND THE AGENTS OF ISRAEL.” ACCORDING TO BIZRI, “WHAT HAS COME TO PASS IS THE WORK OF SIDONIANS,” NOT OF ARAFAT PALESTINIANS. HE CALLED THE EXODUS OF CHRISTIAN VILLAGERS AN “ISRAELI PLOT,” AND CALLED ON THE REFUGEES TO RETURN TO THEIR HOMES. – JA’JA’S CALL FOR A GENERAL STRIKE IN EAST BEIRUT FOR APRIL 27 AS A PROTEST AGAINST SIDON EVENTS, A CALL IN WHICH THE PHALANGE PARTY JOINED 26 APRIL, HAS PROVED SUCCESSFUL, WITH ONLY OCCASIONAL GAS STATIONS, BAKERIES, MOM AND POP CORNER GROCERY STORES, PHARMACIES, AND SIDEWALK NEWSTANDS OPERATING. – CHRISTIAN STUDENT DEMONSTRATORS 26 APRIL NUMBERING AN ESTIMATED 500 STUDENTS, MOSTLY FROM THE SOUTH, MARCHED ON THE MINISTRY OF DEFENSE TO CRITICIZE THE FAILURE OF LAF TO DEPLOY TO PROTECT THE VILLAGES AFTER THE WITHDRAWAL OF THE LEBANESE FORCES. DELEGATIONS OF DEMONSTRATORS MET WITH LAF COMMANDER GENERAL A’OUN. THE ONLY LAF REACTION THUS FAR HAS BEEN A CALL BY GENERAL A’OUN FOR LAF SOLDIERS IN THE SIDON REGION TO REPORT TO THEIR UNITS. – ANOTHER DEMONSTRATION BY SOUTHERNERS RESIDING IN BEIRUT OCCURRED 26 APRIL ON THE AUTOSTRADE NORTHEAST OF THE CAPITAL, WITH DEMONSTRATORS BLOCKING ROADS, BURNING TIRES, AND FIRING IN THE AIR. OTHER DEMONSTRATIONS IN EAST BEIRUT ARE REPORTEDLY SCHEDULED FOR APRIL 27. – APPARENTLY AS THE RESULT OF AMAL LEADER BARRI WORKING WITH CHRISTIAN LEADERS, AMAL HAS REPORTEDLY DEPLOYED IN STRENGTH OUTSIDE THE CHRISTIAN VILLAGE OF MAGHDUSHAH (POP. 8000) NEAR MIYAH MIYAH TO PROVIDE PROTECTION TO THE VILLAGE AGAINST ADVANCING PALESTINIAN/MUSLIM FORCES. MAGHDUSHAH REMAINS CALM AND SECURE 27 APRIL. 4. COMMENT. ESTIMATES OF NUMBERS OF REFUGEES APPEAR EXAGGERATED, AS DO LOCAL STORIES OF “PALESTINIAN HORDES LOOTING AND BURNING.” NONETHELESS, THIS PERSPECTIVE REFLECTS DEEP CHRISTIAN ANXIETY OVER THE SIDON EVENTS. THE MAIN TARGETS FOR CHRISTIAN REACTION ARE LAF, FOR ITS FAILURE TO DEPLOY AS AGREED TO REPLACE DEPARTING LF FORCES, AND MUSLIM LEADERS FOR “FAILING TO KEEP THEIR WORD” TO PROTECT CHRISTIANS IN THE SOUTH AS AGREED ALSO AS THE PRICE OF LF PULLOUT. BARRI’S AMAL GETS GRUDGING CREDIT FOR DEPLOYING OUTSIDE MAGHDUSHAH. 5. LAF DEPLOYMENT AWAITS “POLITICAL COVER” WHICH A’OUN TRIES TO INSIST ON BEFORE ACTING. SATURDAY, APRIL 27, IS FULL OF MEETINGS, CONSULTATIONS, TRAVELS, ETC., TRYING TO SET UP BACKSTAGE ARRANGEMENTS WHICH WOULD PROVIDE SUCH COVER. 6. SOME CHRISTIANS INTERPRET THE ABSENCE OF “POLITICAL COVER” FOR LAF DEPLOYMENT AS A REFLECTION OF AN AGREEMENT TO COMPENSATE THE SUNNIS IN SIDON FOR WHAT THEY LOST IN WEST BEIRUT. THE MAIN WINNER THUS FAR, HOWEVER, APPEARS TO BE THE ARAFATI PLO, WHICH HAS EXPANDED ITS CONTROL AND STRENGTHENED ITS POSITION AROUND THE CAMPS, A RESULT WHICH PRESUMABLY WILL NOT WARM ASSAD’S HEART. 7. THE PHALANGE’S JOINING IN THE CALL FOR A GENERAL STRIKE IN PROTEST AGAINST THE SIDON EVENTS AND GOVERNMENT/LAF INACTION MAKES IT MORE DIFFICULT TO PORTRAY BEIRUT DEMONSTRATIONS AS LF-INTIFIDA ALONE DEFENDING CHRISTIAN INTERESTS, BUT FASTER REACTION WOULD HAVE GAINED THEM MORE CREDIT. 2. SUMMARY: MFA DIRECTOR GENERAL KIMCHE BRIEFED AMBAS- SADORS FROM UN SECURITY COUNCIL AND UNIFIL CONTRIBUTOR COUNTRIES JUNE 12 ON SOUTHERN LEBANON. KIMCHE REITERATED ISRAELI POLICY IN SOUTHERN LEBANON LEADING UP TO THE WITHDRAWAL, THEN EMPHASIZED THAT ISRAEL WAS NOW OUT OF LEBANON AND, THEREFORE, NO LONGER IN CONTROL. AS A RE- SULT, ALTHOUGH ISRAEL WAS TRYING TO BE HELPFUL, ISRAEL FELT THAT UNIFIL MUST WORK OUT THE PROBLEM OF THE FINNISH HOSTAGES WITH THE SLA DIRECTLY. IF ISRAEL SOUGHT TO CONTROL EVENTS AND FORCE LAHAD TO RELEASE THE FINNISH SOLDIERS, ISRAEL WOULD, IN EFFECT, BE BACK IN LEBANON. THERE WOULD BE NO MORE SLA AND LAHAD WOULD BE FINISHED. SEVERAL AMBASSADORS SAID THEIR GOVERNMENTS CONSIDER ISRAEL TO REMAIN RESPONSIBLE FOR THE SAFETY OF THE UNIFIL SOLDIERS, AND MADE STRONG STATEMENTS OF PRINCIPLE AGAINST THE HOLDING OF HOSTAGES. END SUMMARY. – 3. MFA DIRECTOR GENERAL DAVID KIMCHE INVITED THE AMBAS- SADORS AND CHARGES FROM THE UN SECURITY COUNCIL MEMBER STATES AND THE CONTRIBUTORS TO UNIFIL TO A BRIEFING JUNE 12 ON ISRAEL’S POLICY IN SOUTH LEBANON. THE BRIEFING INVITATION WAS STIMULATED BY THE PRESENT CRISIS BETWEEN UNIFIL AND THE SOUTH LEBANESE ARMY. KIMCHE SOUGHT TO PLACE THE ISRAELI REACTION TO THE CURRENT CRISIS IN THE BROAD CONTEXT OF ISRAELI POLICY. KIMCHE OPENED BY NOTING THAT THERE IS A CABINET DECISION ON SOUTHERN LEBANON THAT CONTINUES TO BE THE BASIS OF ISRAELI ACTIONS, UNTIL THERE IS A CABINET DECISION TO CHANGE IT. THE DECISION INCLUDES THE FOLLOW- ING ELEMENTS: A) THE IDF IS REDEPLOYED ALONG THE INTER- NATIONAL FRONTIER, AND NO IDF UNITS WILL REMAIN IN LEBANON ON A REGULAR OR PERMANENT BASIS. B) THE IDF RE- TAINS FREEDOM OF ACTION AGAINST TERRORISTS BEFORE, DURING OR AFTER THEIR ACTIVITIES AGAINST ISRAEL. C) A SECURITY ZONE HAS BEEN ESTABLISHED, WITH ISRAELI LIAISON WITH LOCAL FORCES WHICH ARE DEDICATED AGAINST TERRORISM. D) IF THE LOCAL FORCES ARE ATTACKED THE IDF MAY RESPOND TO PROTECT THEM. KIMCHE SAID THAT THE GOVERNMENT OF ISRAEL HAS HELPED AND CONTINUES TO HELP THE SOUTH LEBANON (SLA), BUT NO LONGER CONTROLS THE SECURITY ZONE. HE SAID THE RELATIONSHIP WITH THE SLA IS ONE OF LIAISON AND ADVICE, BUT IT DOES NOT PERMIT ISRAEL TO GIVE ORDERS, AND THE SLA IS NOT A DE FACTO ISRAELI FORCE. THE SLA IS LEBANESE, COMMANDED BY A LEBANESE GENERAL, AND IT BEHAVES AS THE LEBANESE BEHAVE, NOT AS ISRAELIS WOULD. THIS MEANS THAT THE SLA OFTEN ACTS IN A MANNER WHICH IS DISTASTEFUL TO ISRAEL. KIMCHE SAID THE GOVERNMENT OF ISRAEL DEPLORES “THE UNFORTUNATE INCIDENT”, AND WOULD LIKE TO SEE IT SETTLED. HE SAID ISRAEL HAS GIVEN THE FOLLOWING ADVICE TO THE SLA: A) NOT TO HARM ANY OF THE HOSTAGES; HE SAID THE SLA HAS COMMITTED ITSELF TO DO NO HARM TO THE FINNISH SOLDIERS, AND THIS IS BEING OBSERVED. B) ISRAEL HAS ADVISED LAHAD TO RELEASE THE HOSTAGES IN THE FRAMEWORK OF TALKS WITH UNIFIL. HE SAID THAT THE ISSUE MUST BE RESOLVED BY UNIFIL AND THE SLA DIRECTLY. ON NO ACCOUNT, HE EMPHASIZED, SHOUL ISRAEL BE A DIRECT PARTY. ISRAEL IS OUT OF LEBANON; IF IT WERE TO DEAL DIRECTLY THAT WOULD INDICATE THAT ISRAEL IS STILL IN. KIMCHE VOLUNTEERED THAT IT IS TRUE THAT ISRAEL STILL HAS LIAISON OFFICERS IN SOUTHERN LEBANON, BUT HE ASSERTED THAT THE NUMBERS ARE FEWER THAN THOSE WHICH WERE ACCEPTED IN THE MAY 17 AGREEMENT WHICH HAD BEEN WELCOMED BY MANY STATES INCLUDING EGYPT. KIMCHE SAID THAT THE MEETING BETWEEN GENERALS LAHAD AND PONS IS A STEP IN THE RIGHT DIRECTION. HE SAID THEY DIS- CUSSED THE RELEASE OF THE CAPTIVES; THE GOVERNMENT OF ISRAEL THOUGHT THEY SHOULD HAVE MET FROM THE VERY BEGIN- NING, BUT THIS MEETING AT LEAST WAS HELD IN A GOOD ATMOSPHERE. THE GIST OF THE MEETING WAS: LAHAD ASKED UNIFIL FOR THE ELEVEN SLA TROOPS TO BE BROUGHT TO A NEUTRAL PLACE WHERE IT COULD BE DETERMINED WHETHER THEY HAD IN FACT DEFECTED OR HAD BEEN CAPTURED AND TURNED OVER TO AMAL. HE SAID THAT IF THE ELEVEN STATE THAT THEY HAD DEFECTED, THE FINNS WILL BE RELEASED IMMEDIATELY BY LAHAD. IT HAD ALSO BEEN AGREED DURING THE MEETING TO APPOINT LIAISON OFFICERS BETWEEN GENERALS PONS AND LAHAD, AND UNIFIL HAD SECURED THE RIGHT TO VISIT THE FINNISH SOLDIERS EVERY THREE OR FOUR DAYS. KIMCHE SAID, OF COURSE HE HOPED THE PROBLEM WOULD BE SOLVED BEFORE THAT TIME LIMIT. KIMCHE CONCLUDED THAT HE BELIEVED THAT IT WAS NOW UP TO UNIFIL TO BRING THE ELEVEN TO A NEUTRAL SPOT, PERHAPS NAQURA. KIMCHE OFFERED THE FOLLOWING ADDITIONAL REMARKS: SINCE THERE IS NO CENTRAL GOVERNMENT IN LEBANON, ISRAEL UNDER- STANDS THE NEED FOR UNIFIL TO HAVE RELATIONS WITH THE AMAL MILITIAS. IN FACT HE SAID THIS IS A POSITIVE THING. IN THE PAST UNIFIL HAD SAID THAT IT COULD DEAL ONLY WITH THE CENTRAL GOVERNMENT OF LEBANON. BUT SINCE THAT PROVED IMPRACTICAL, AND UNIFIL IS NOW DEALING WITH AMAL, IT SHOULD ALSO DEAL WITH THE SLA. HE SAID THIS NOW SEEMS TO BE IN PROGRESS. ISRAEL, HE SAID, WOULD LIKE A STRONG CEN- TRAL GOVERNMENT IN LEBANON, AND WOULD LIKE TO HAVE LIAISON WITH THE LEBANESE ARMY. BUT THIS IS NOT FEASIBLE, AND THERE IS LITTLE HOPE FOR IMPROVEMENT IN THE FORESEEABL FUTURE. KIMCHE THEN DESCRIBED THE INTERFACTIONAL FIGHTING WITHIN LEBANON, NOTING THAT IT APPEARS THAT ALL FACTIONS ARE NOW FIGHTING WITH ALL OTHERS, FOLLOWING A RECENT REPORT OF A SHIA-DRUZE CONFLICT THIS MORNING. KIMCHE SAID THAT JAZZIN COULD BE THE NEW FLASHPOINT. HE SAID THAT THE GOVERNMENT OF ISRAEL HAD NEVER TOLD OR ADVISED THE SLA TO GO TO JAZZIN, AND FURTHER ADVISED THE SLA THAT IF IT DECIDED TO GO TO JAZZIN, ISRAEL WOULD NOT HELP THE SLA BECAUSE JAZZIN IS OUTSIDE THE SECURITY ZONE. THE GOVERNMENT OF ISRAEL HAD PROPOSED TO UNIFIL THAT IT DEPLOY TO JAZZIN, SINCE IT HAD FORCES CLOSE BY. HE SAID THE GOI WOULD WELCOME A UNIFIL DEPLOY- MENT TO JAZZIN AND WOULD ADVISE THE SLA TO WITHDRAW IN THAT CASE. THE UN SECRETARY HAD THOUGHT THIS WAS A GOOD IDEA AND TRIED IT OUT WITH PRESIDENT GEMAYEL. GEMAYEL ALSO, ACCORDING TO KIMCHE, THOUGHT IT WAS A GOOD IDEA BUT DECLINED TO REQUEST A UNIFIL PRESENCE IN JAZZIN BECAUSE HE KNEW HE COULDN’T GAIN THE SUPPORT OF EITHER SYRIA OR HIS OWN PRIME MINISTER. HE SAID THIS ALSO DEMONSTRATES THE WEAKNESS OF THE GOVERNMENT OF LEBANON. KIMCHE SAID HE DID NOT KNOW THE FACTS. HE SAID THE INVESTIGATION WAS UNDERWAY, BUT IT APPEARED THAT THE UN STILL BELIEVES THAT THE ELEVEN SLA TROOPS DEFECTED. THE GOI, HE SAID, IS SKEPTICAL; IT BELIEVES THEY WERE ABDUCTED FOR THE FOLLOWING REASONS WHICH KIMCHE ADMITTED WERE CIRCUMSTANTIAL: A) ALL OF THE ELEVEN LEFT THEIR FAMILIES BEHIND. KNOWING THAT THE SLA IS NOT A GENTLE FORCE, THEY WOULD CLEARLY HAVE BEEN AFRAID FOR THEIR FAMILIES IF THEY HAD VOLUNTARILY DEFECTED. B) SHORTLY AFTER THE SLA ELEVEN WERE MOVED TO TYRE, AMAL LEADER NABIH BERRI SAID THAT HE WOULD EXCHANGE THE ELEVEN PRISONERS FOR THE SHIA PRISONERS HELD IN ISRAEL. KIMCHE SAID IT WOULD BE RARE INDEED TO OFFER TO EXCHANGE DEFECTORS FOR OTHER PRISONERS. C) HE THEN SHOWED A TV FILM MADE BY A SYRIAN CREW JUST AFTER THE ELEVEN REACHED TYRE. THE CAPTIVES WERE SHOWN BEING HELD UNDER ARMED GUARD, SULLEN, APPARENTLY FEARFUL, AND RESPONDING TO ORDERS BY THEIR GUARDS. KIMCHE SAID THIS APPEARED NOT TO BE THE DEMEANOR OF PERSONS WHO HAD VOLUNTARILY DEFECTED. – 11. KIMCHE CONCLUDED THIS SESSION BY NOTING THAT ISRAEL MAY NEVER KNOW THE TRUTH, BUT THAT THE GOVERNMENT OF ISRAE WANTS THE FINNS RELEASED AS SOON AS POSSIBLE. HE SAID THAT ALL THAT ISRAEL WANTS IS PEACE ON THE NORTHERN FRONTIER. THE BRITISH AMBASSADOR NOTED THAT THERE WAS A PRESS REPORT THAT THE GOVERNMENT OF ISRAEL WOULD CONTEMPLATE A MOVE OF UNIFIL TO THE BORDER UNDER AN ARRANGEMENT AGREED TO WITH THE SLA. KIMCHE SAID THE UN HAD PRESENTED SOME IDEAS TO THE GOI ON THE POSSIBILITY OF A UNIFIL DEPLOYMENT TO THE BORDER WITH THE DE FACTO COOPERATION OF THE SLA. NO DECISION HAD BEEN REACHED, AND THE SUBJECT WAS NOT THOROUGHLY DISCUSSED IN THE RABIN/URQUHART MEETING YESTERDAY. HE NOTED, HOWEVER, THAT IN THE MEANTIME, UNTIL SUCH AN ARRANGEMENT IS WORKED OUT, ISRAELI POLICY, AS DETERMINED BY THE CABINET, REMAINS. HE ADDED HOWEVER, THAT ISRAEL IS PREPARED TO CONSIDER ANY IDEAS FOR STRENGTHENING THE STABILITY OF THE BORDER AREA. – 13. THE ITALIAN AMBASSADOR NOTED THAT THE EC-10 HAD MET AND HAD MADE A GENERAL STATEMENT ON LEBANON. HE SAID THE FOREIGN MINISTERS OF THE TEN CONSIDERED THE INCIDENT VERY SERIOUS. THEIR OPINION WAS THAT EVERY MEASURE SHOULD BE TAKEN TO FREE ALL HOSTAGES. AMBASSADOR TALIANI ADDED A PERSONAL NOTE SAYING THAT IT WAS DIFFICULT FOR HIM TO ACCEPT ISRAELI DISCLAIMERS OF RESPONSIBILITY IN VIEW OF THE FACT THAT ISRAEL HAD ARMED AND EQUIPPED AND CONTINUED TO PAY THE SLA. KIMCHE REPLIED THAT GIVING ASSISTANCE DOES NOT MEAN CONTROL. FOR EXAMPLE, HE SAID, THE 3,000 SOVIET ADVISERS IN SYRIA DO NOT MEAN THAT THE SOVIET UNION CONTROLS SYRIA. HE SAID IF ISRAEL ACCEPTED THE ITALIAN AMBASSADOR’S PREMISE, THE IDF WOULD BE DOOMED TO STAY IN LEBANON IN ORDER TO MAINTAIN CONTROL. – 14. THE SWEDISH AMBASSADOR STATED THE STRONG DESIRE OF HIS GOVERNMENT TO HAVE THE FINNISH TROOPS RELEASED AS SOON AS POSSIBLE. HE ADDED THAT HE FELT THAT THE GOVERNMENT OF ISRAEL HAS A STRONG RESPONSIBILITY FOR THE RELEASE. 15. THE BRITISH AMBASSADOR INTERVENED AGAIN TO NOTE THAT IT WAS A VERY DANGEROUS PRECEDENT TO ACCEPT THE TAKING OF HOSTAGES. HE SAID HIS MAJESTY’S GOVERNMENT WAS VERY EXERCISED OVER THE HOSTAGE ISSUE. HE SAID ANY ACTION THAT ENCOURAGES THE TAKING OF HOSTAGES IS BAD BOTH IN THIS CASE AND IN THE GENERAL SENSE. KIMCHE SAID HE AGREED THAT ANY TAKING OF HOSTAGES IS BAD. HE CONCEDED THAT PERHAPS ISRAEL COULD SEND IN ITS TROOPS TO FORCE THEIR RELEASE. BUT IF THE IDF DID GO IN, IT WOULD MEAN THE END OF THE SLA, AND THE GOI WOULD HAVE TO BE BACK IN LEBANON TO STAY. HE SAID ISRAEL HAS GIVEN STRONG ADVICE TO LAHAD THAT IT WAS WRONG TO HOLD HOSTAGES. BUT HE ADDED THAT THE ELEVEN SLA TROOPS MAY ALSO BE AS MUCH HOSTAGE AS THE FINNS. HE SAID THEREFORE THE ONLY LINE OF ATTACK IS TO FOLLOW UP ON THE LAHAD PROPOSAL. HE THEN URGED THE CONTRIBUTORS TO UNIFUL TO PRESS THE UN TO HAVE THE AMAL BRING THE ELEVEN TROOPS TO THE NEUTRAL ZONE SO IT COULD DETERMINE IF THEY WERE VOLUNTARILY DEFECTORS OR IN FACT CAPTIVES. 16. THE AUSTRALIAN AMBASSADOR SAID THAT HIS GOVERNMENT WELCOMES THE ISRAELI WITHDRAWAL FROM LEBANON, BUT ADDED THAT THE CONTINUING PRESENCE OF LIAISON OFFICERS LEAVES THE GOVERNMENT OF ISRAEL CONSIDERABLE RESPONSIBILITY FOR THE CIRCUMSTANCES AT PRESENT. HE SAID THE HOSTAGES SHOULD BE RELEASED WITHOUT CONDITIONS IMMEDIATELY. – 17. COMMENT – THIS WAS THE THIRD OF A SERIES OF MEETINGS THAT KIMCHE HAS HAD WITH THIS GROUP ON LEBANON. KIMCHE STATED THE CASE WITH CLARITY AND PRECISION, BUT HIS AUDIENCE WAS NOT CONVINCED. CONCERNING THE HOSTAGES, HE REPEATED SEVERAL TIMES THAT ISRAEL COULD BE EITHER IN LEBANON OR OUT, AND IF OUT, ISRAEL COULD NOT FORCE LAHAD TO DO WHAT HE DIDN’T WANT TO DO. BEHIND THIS DENIAL OF CONTROL OF LAHAD IS KIMCHE’S CONVICTION THAT TO TRY TO FORCE LAHAD WOULD MEAN THE END OF LAHAD AND LAHAD’S FORCES CLEARLY THIS IS A CARD WHICH ISRAEL HAS NOT BEEN WILLING TO PLAY. IT IS ALSO CLEAR, AS KIMCHE IMPLIED SEVERAL TIMES, THAT ISRAELI POLICY ON SOUTHERN LEBANON IS SUBJECT TO CHANGE AS THE TACTICAL SITUATION SHIFTS. BUT ISRAEL IS STILL COMMITTED TO SUPPORTING LAHAD IN GENERAL AND IN HIS CONFRONTATION WITH UNIFIL, AND IS UNWILLING TO FACE THE CONSEQUENCES OF THE DISINTEGRATION OF THE SLA. IF THE SLA SHOULD CRUMBLE, THE PERES GOVERNMENT’S LEBANON WITH- DRAWAL DECISION, UP TO NOW A VERY POPULAR ONE, COULD SPRING AGAIN INTO THE CENTER OF POLITICAL CONTRO- VERSY HERE. CERTAINLY SHARON AND HIS ALLIES WOULD MAKE THE MOST OF IT TO WEAKEN THE PERES GOVERNMENT AND FURTHER INHIBIT ITS ABILITY TO MOVE FORWARD ON EITHER THE EGYPTIAN FRONT OR THE PEACE PROCESS ISSUES NOW UNDER DISCUSSION.